Skiers and snowboarders are celebrating November on the slopes this season during Mountain High’s Snowvember promotion. 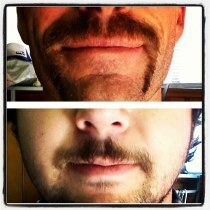 Any guest who shows their Movember mustache at the ticket windows will receive a FREE Express Pass ($10 value). 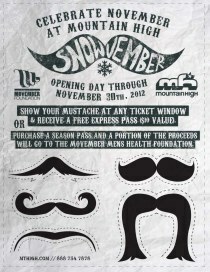 Mustaches can be real or imitation and Mountain High has included several fun samples in their Snowvember flyer. The Express Pass is Mountain High’s loyalty card which saves users $10 on every visit, non-holiday, earns them a FREE lift ticket after five visits, and tracks their days ridden, runs per day, vertical feet, and more. Click here to learn more about the Express Pass. Mountain High’s season passes are currently on sale for up to 50% off but there are only a few left so guests are advised to act quickly. Normally these passes sell out by Thanksgiving if not earlier. Click here to learn more about Mountain High’s Snowvember season pass sale including pricing and benefits. Wear your staches and spend your Snowvember on the slopes at Mountain High, Southern California’s closest winter resort, now open for the 2012/13 season. For more information or to schedule an interview, please contact Kim Hermon, Marketing Manager, at (760) 316-7830 or kim_hermon@mthigh.com.